or optics to remain a competitive technology in the race for new quantum communication and computation systems, new sources of single photons are required. To scale fundamental demonstrations to practical technology the available number of indistinguishable photons must be increased. Traditionally single photons have been generated by spontaneous parametric down conversion, a process that has a fundamental trade-off between the probability of producing a single photon (brightness), and its quality. Single photon sources based on quantum dots deterministically coupled to micro-pillar cavities have been shown to be high brightness indistinguishable single photon sources. However due to fabrication imperfections it has been difficult to establish independent sources which produce single photons. Therefore we must employ a multiplexing scheme which takes consecutively emitted photons from one quantum dot and temporally overlaps them to produce many indistinguishable photons in a scalable manner. e achieve this by using a high speed electro-optically reconfigurable integrated photonic switch. Fabricated by an annealed proton exchange process in lithium niobate this switch is capable of routing single photons to each of its outputs in order at the full repetition rate of the laser (80MHz). With the addition of optical fibre delay lines with lengths differing by the repetition rate at each output, this can temporally overlap many consecutively emitted photons. 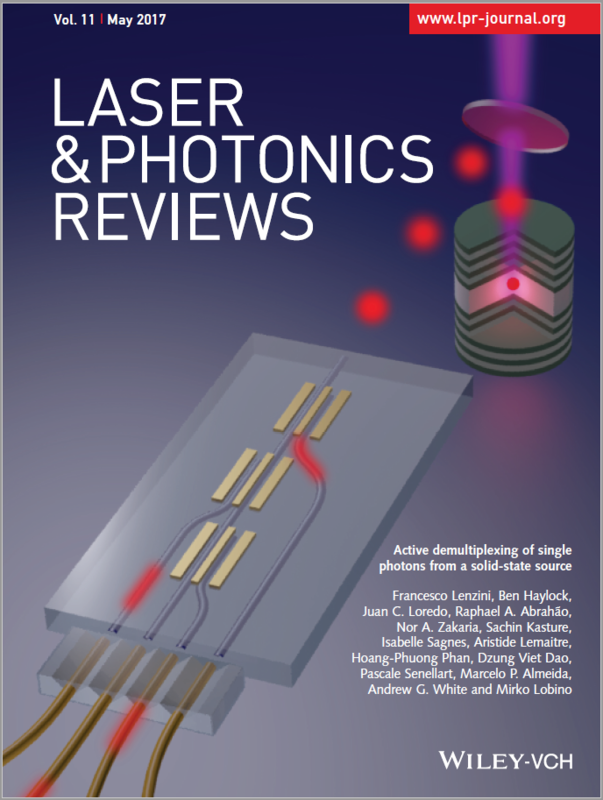 Through a collaboration with Prof. Andrew White at UQ, and Prof. Pascale Senellart at CNRS-LPN we demonstrated quasi-deterministic switching of the path of single photons with an efficiency of, where n is the number of paths. With the performance of the current switch we can expect to create a six photon source with a rate three orders of magnitude higher than spontaneous parametric down conversion providing a scalable platform for increasing the complexity of quantum optics experiments. 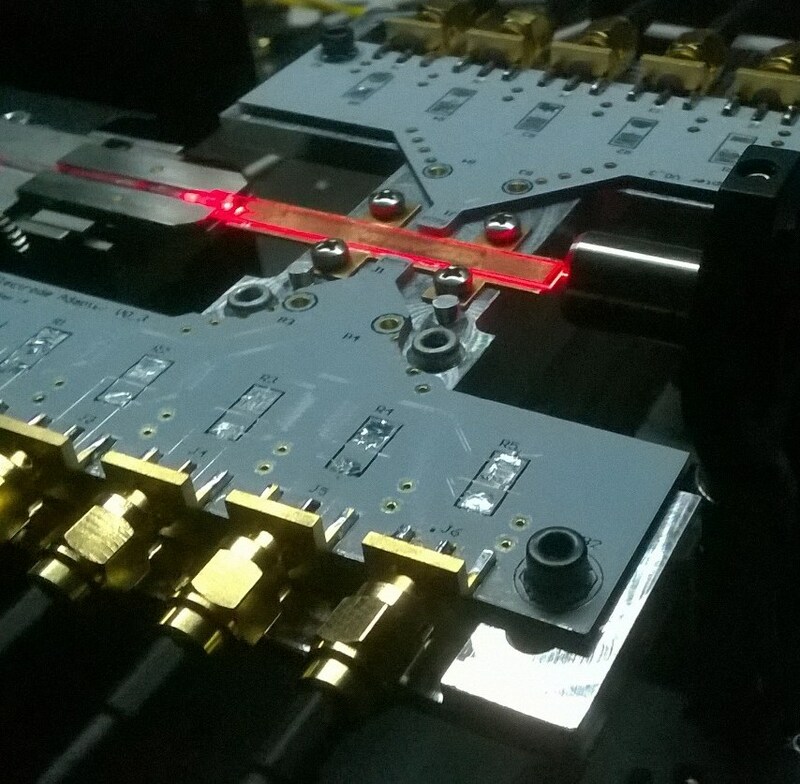 Image of active single photon demultiplexer.